Makhar Vaziyev speaking to the Associated Press in the Bolshoi Theater in Moscow in April 2016. From July 25 to August 13, the Bolshoi Ballet will be performing at London’s Royal Opera House. This is the company’s first tour under the stewardship of its new artistic director, Makhar Vaziyev, a familiar figure in the ballet world thanks to his work at the Mariinsky Theater in St. Petersburg and La Scala in Milan. RBTH recently caught up with him. RBTH: While you were heading the La Scala Ballet for the past seven years, were you following developments at the Bolshoi? Makhar Vaziyev: Of course. The fact that I was working in another country did not mean that I did not know what was happening in our country as a whole and its theater life in particular, including in the Bolshoi and Mariinsky theaters. 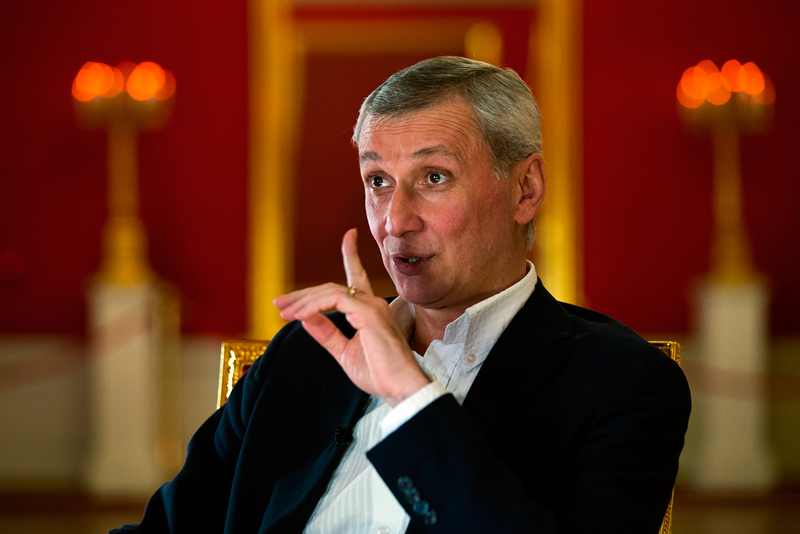 Naturally, when we started having discussions with Bolshoi Theater general director Vladimir Urin, I began to take a closer look at what is happening here. RBTH: To what extent did your expectations match reality? M.V. : I did not have any major surprises except that I did not expect to see a list of 63 soloists in the ballet company. I was surprised by such a big number. I am truly grateful to Urin for presenting me with an absolutely accurate picture so that I was spared any unnecessary illusions. Another thing that I did not know were the company, the people. RBTH: Have you had time to get to know them? M.V. : Yes, today I know them. I have been working with them for four months already. I like the company. There are many talented people: teachers, dancers, both those who are already established artists and beginners. The company has an enormous repertoire. So, there is a lot of work to do. RBTH: What do you see as your task as the head of the company? M.V. : My main task is to help the company, help the dancers and the teachers to build a creative atmosphere. Actors feel motivated when they have an opportunity to grow. Trust me, even if you offer very attractive pay but do not offer the dancer any chance to grow, sooner or later they will simply begin to howl. That is why the most important thing is to give them an opportunity to grow. How is it done? Everybody should work 24 hours a day and that’s it. And feel it not as a punishment but as a joy. I can tell you that I work 12-13 hours every day. Nobody is making me do it. I enjoy doing it. It is only at this pace that one can move forward these days. RBTH: What memories do you have of your work in Milan? M.V. : It was a wonderful learning experience. Terrific. At first, I did not really want to go there. Why? Imagine, when I saw the company for the first time it was back when the retirement age for male dancers was 52 and for female dancers, 47. I could not understand what to do with them, what goals to set them. RBTH: Did you have to study the Italian constitution? M.V. : Parts of it, yes. But it is unlikely that I would have managed to do anything without Lissner’s support. Many times I broke all the rules and all the laws: there was simply no other way to achieve anything. I am used to working rather than pretending that I am working, albeit in a wonderful theater. It is of little interest to me whether it is La Scala or another theater: I am interested in the substance. True, there were people in the theater administration who were outraged at what I was doing. But I was forgiven these irregularities. I think everybody understood why I was doing it. And within the constraints of the existing conditions we did indeed manage to achieve decent results. RBTH: How do you feel about Bolshoi Ballet actively broadcasting its performances in cinemas around the world, online, in Moscow’s Teatralnaya Square? M.V. : Several days ago, the Bolshoi Theater for the first time launched live broadcasts of its performances in Moscow’s Teatralnaya Square [outside the Bolshoi building]. In the intervals, I would go to my office and see from the window that people even brought their own chairs. And I told the dancers: ‘See how people love us, how they support us.’ On the first day, the weather was not very warm but still a huge number of people came. So, I am all for any available formats that give us the opportunity to share our art. RBTH: In the next several days, the Bolshoi Ballet will start its tour of London. Performances on the Covent Garden stage can have an impact on a company’s reputation all over the world. M.V. : Of course, there is no denying the fact that there will be 2,000 people in the audience but the Financial Times has a readership of millions of people all over the world, and public opinion is most likely shaped by what it and a handful of other British newspapers will say. But I would like to point out that the Bolshoi Theater is not a newborn company. We have a long history and the Bolshoi brand is known all over the world. That is why a far more important task for us is to dance as well as possible in Moscow. If we achieve that in Moscow, it will be appreciated in London, in Paris and in Beijing. If you look at the dancers slated to perform in London, you will see that they are the same people who dance these parts at home, too. RBTH: Yet, this time around the London season will be opened not by Svetlana Zakharova but by Olga Smirnova, whom, sensationally, you have entrusted with Don Quixote. M.V. : I would be very happy for Zakharova to open the tour. However, her contracts were signed before the London tour came into being. That is why she will perform in the UK, but closer to the end of the tour. As for Smirnova, I had heard of her even before I joined the Bolshoi as a very talented performer of lyrical parts. But when I saw her in rehearsals I realized that there is a lot of playful mischievousness in her. She is a rather sunny girl. She was surprised herself when I suggested that she prepare for Don Quixote. And now, I think, it is a part that she was born to dance.